Unfortunately, the Green Hotel was demolished in April 2015. The Green Hotel, also known as the Green Castle Hotel or The Green, is a significant example of a Second Empire style brick hotel. It was built in 1881 by Lewis M. Green, a five-term mayor of Woodbury and father of George Gill Green, a wealthy patent medicine entrepreneur, and businessman. The Green family helped to attract residents and businesses to Woodbury in the late 19th and early 20th century when the city experienced significant growth. The Green Hotel was constructed in response to this growth, serving to accommodate visitors arriving by train at the Woodbury Station, directly across Railroad Avenue. 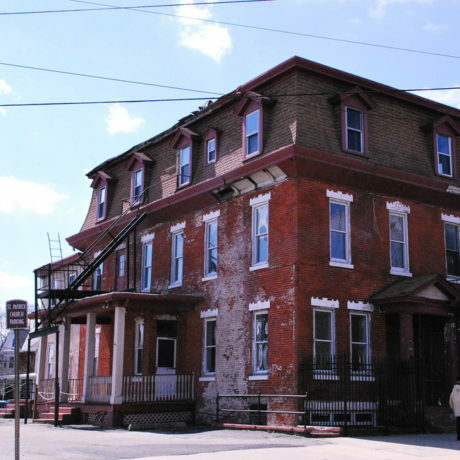 The Green Hotel is a contributing building within the Green Era Historic District, which is listed on the New Jersey Register of Historic Places, and the municipally designated Woodbury Historic District. As originally constructed, the building had a mansard roof, red brick exterior, windows with decorative keystones (one of which on the main elevation retains L. M. Green’s carved initials and the construction year), and a wrap-around porch with decorative brackets and posts. While the building has been modified over the course of its use: the front porch was removed, an addition was constructed on the front façade and a new entry and porch were added to the side elevation: the building’s main block, stylistic form (including its signature roof) and decorative details remain remarkably intact. Over the course of the 20th century, the hotel became a boarding house and was subdivided into apartments in 1920. In 2006, The Green was purchased by what was then St. Patrick’s Roman Catholic Church, located directly across Cooper Street from the building. Since that time, St. Patrick’s has combined with two other congregations to form Holy Angels Parish. The new combined parish has determined no use for the former apartment building. It is currently vacant, used only in part for storage. Today, the building retains its historic relationship to the neighboring Woodbury Station and railroad tracks, illustrating Woodbury’s prominence during the late 19th century, and the significance of rail traffic to that prominence. The station has been rehabilitated as a café. The neighborhood surrounding The Green is a combination of residences and businesses that service the nearby Gloucester County Courthouse, including offices for attorneys, paralegals, and other support professions. The Green Hotel’s existence as part of that neighborhood, however, is threatened. In February 2012, Holy Angels Parish applied to Woodbury’s Historic Preservation Commission (HPC) for a certificate of appropriateness to demolish the building and pave the entire site as surface parking. The certificate was denied by the HPC, which acts as an advisory board, and two subsequent appeals to the Planning and Zoning Board and City Council were also denied. But the parish maintains that it cannot afford to restore or rehabilitate the building, which remains unused. The major threats to this property are its vacancy and neglect and poor stewardship on the part of the present owners, who could utilize this structure for its own community programs and services, or lease the building to another charitable non-profit for a variety of uses, including offices, transitional or permanent housing or daycare. The building might also be sold outright to a for-profit business, as are many of the neighboring former residential buildings, or to a developer that would rehabilitate the apartments. The building represents a sustainable resource that should be maintained and utilized, not emptied into a landfill. Particularly disturbing is the parish’s claim to need additional parking when the church maintains its own parking lot surrounding the church building and has access to a free street and parking garages within a one-two block radius of the church. The unbuilt portion of the Green Hotel site is also currently used by the church for parking, and destruction of the Green Hotel would add an extremely limited number of additional spaces. The parish should be encouraged to show greater responsibility to the environment and to its community by investing in the revitalization of the existing building, instead of financing demolition and parking lot construction. The Green Hotel is an important local landmark. The loss of this substantially intact Second Empire style commercial building, associated with the influential Green family, and located at a gateway intersection to downtown Woodbury, would further strip Woodbury of its sense of place and the historic character that has defined the community for over 100 years. While the building has been modified architecturally, the main structure and decoration of the Green Hotel remains but lost details such as the porch and keystones could be replicated in an exterior restoration project. While the interior has been divided into apartments, this could benefit planning to adapt it for a new use, such as non-profit or for-profit office space or rental apartments. A future light rail station proposed for a location near the Green Hotel promises to bring additional, transit-oriented revitalization opportunity. The Green Hotel needs a plan for rehabilitation and reuse, either by the parish or via a change of ownership to a steward who can consider additional uses for this structure as a valuable and sustainable contributor to the city. This structure’s plight calls attention to the City of Woodbury’s hard work to cultivate Woodbury’s recognition as a historic community with six designated historic districts. In denying the demolition request, the city has appropriately affirmed, at every level, its support of the building’s preservation as a contributing resource within the registered historic district. Ultimately, preserving the Green Hotel is an important milestone in demonstrating the city’s commitment to the integrity of its historic community, and encouraging those property stewards who are equally respectful.